but I have done this and can attest that they sound good. The Boss MG-10 is a small solid-state amplifier that gives a very good clean sound and some far-out distorted sounds. I bought mine in 1989 and have modded it twice – I moved the carrying handle to the right of the cab so that I could stack gear on top of it, like effects and so on, and patched the output so you can either play the amp through a different cab, or the play a different amp through the cab. I like it so much…I have two! 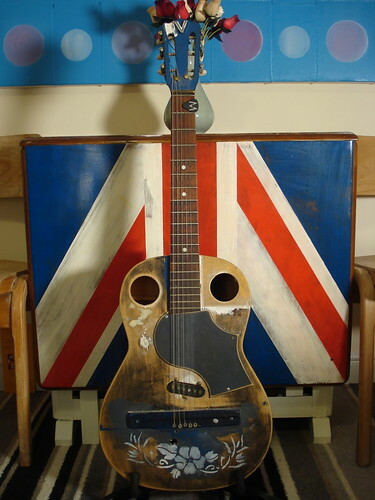 The guitar is an ancient old acoustic which has been given a good seeing to over the years. It has an old alnico telecaster style pickup wired straight to a jack socket, a massive bridge, a “scratchplate” which really only serves to cover the original soundhole, and two new soundholes, one of which had to be cut from a newly transplanted bit of wood after getting too passionate with the hacksaw first time around. The finish veers somewhere between remnants of the original sunburst, blue satinwood, grey emulsion, bare wood, paper and stencilled flowers. Plus tape “binding”. It is, of course, called Harry. …and in February 2011 it was featured on the legendary Guitarz blog. UPDATE: a new recording of Harry is available here. 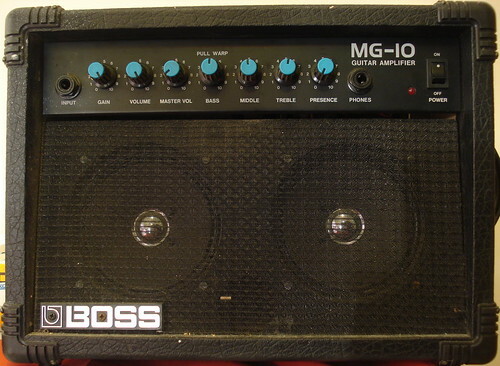 This entry was posted in Music technology and tagged amplifier, Boss MG-10, Guitar, modding. Bookmark the permalink.